High Electric Bill? 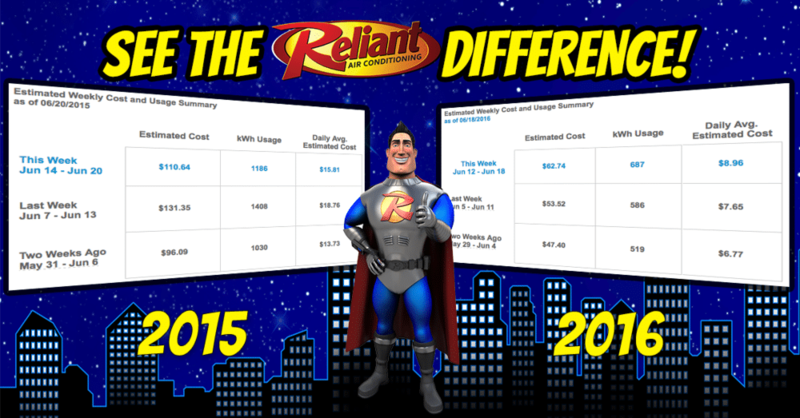 See The Reliant Difference! Cha-ching! Hear that? Well, if you’ve got a new energy-efficient system from Reliant Air Conditioning, that’s the sound of ridiculous savings on your summer energy costs following your AC replacement. What you won’t hear, however, is the sound of that old system knocking and grinding and your significant other lamenting your monthly bill in the next room. We love numbers around here, especially when a customer shares with us how much money they’re saving. We recently heard from Natalie, who was super excited when she got her most recent electric bill. But first, let’s share the numbers from when she definitely was not excited about her energy costs back in 2015 – prior to her AC replacement. A whopping $326.51 for June of 2015. Ouch, Natalie. To add insult to injury, they’ve just got to include that little meter showing your usage in the red zone, don’t they. Up, up it goes! Until – wait…what’s that dip in the chart toward the end of the month? Oh, that’s when her system was replaced. No need to adjust your eyes. That $140.55? That’s her bill – for the same home, at the same temperature, and after her system replacement. It feels great to be able to budget, right? Thank you so much for sharing your energy report with us, Natalie! We’re beyond thrilled to hear that you’re happy with your air conditioning service from us, and we’re even more excited that your system is paying for itself over time. If you’ve just been inspired by this little math lesson, contact the gimmick-free heating and air professionals that has been proudly serving the DFW Metroplex since 1983. If you’re in need of an AC tune-up, AC repair, or system replacement, we’ll be there to answer your call. Don’t sit and sweat – contact Reliant today!